Fednav Limited, the largest international bulk shipowner in Canada, today welcomes to the Port of Indiana-Burns Harbor, the Federal Caribou, one of seven new oceangoing lakers equipped with a ballast water treatment system-a first for the Great Lakes. Fednav Limited, the largest international bulk shipowner in Canada, today welcomes to the Port of Indiana-Burns Harbor, the Federal Caribou , one of seven new oceangoing lakers equipped with a ballast water treatment system-a first for the Great Lakes. This vessel protects the Lakes by treating its ballast water two times: by conducting an exchange in the North Atlantic, and through filtration and a chlorine disinfection treatment on the ship. The Federal Caribou is part of a series of 16 Handysize vessels, representing an investment by Fednav of more than $400 million and designed specifically for the Great Lakes. The company is the leading international operator in the Great Lakes, has one of the most modern fleets of bulk carriers in the world, the average age being under 10 years. Of particular interest is the Federal Caribou and its sister-ships have box-shaped holds in order to facilitate the handling of general cargo. In April 2015, Fednav announced the signing of an agreement with JFE Engineering Corporation for the installation of ballast water treatment systems (BallastAce) on board its new ocean-going lakers. 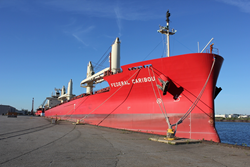 The Federal Caribou is one of those ships, and its voyage to Burns Harbor highlights the fact that Fednav is the first shipping company in the Great Lakes to treat ballast water using an onboard system. JFE is now pursuing US Coast Guard certification, with expected approval in 2017. At the ceremony on board the ship, Paul Pathy, President and Co-CEO of Fednav Limited and Chairman of Federal Marine Terminals noted: "This vessel confirms that the protection of the Great Lakes is a priority for Fednav and demonstrates the confidence we have in the region's future. These ships will allow us to offer our customers in Indiana and throughout the region an unparalleled service at a higher standard." Fednav is the parent company for Federal Marine Terminals, the general cargo stevedore for the Port of Indiana-Burns Harbor. "We commend and congratulate Fednav for its commitment to make these long-term investments that benefit so many on the Great Lakes," said Rich Cooper, CEO for the Ports of Indiana. "The company has always taken the Lake's environment very seriously and being the first to outfit its newer ships with on-board ballast water treatment systems further validates just how committed it really is. We are proud to call Fednav a 'true partner' at our port on Lake Michigan and salute the company for its innovation and leadership in the maritime industry." Fednav Limited, established in 1944 is a privately owned international shipowning and operating company based in Montreal, Quebec. The principal activities of Fednav Limited include the transport of bulk and general cargo worldwide. The company operates a fleet of about 85 vessels and has offices in Antwerp, Barbados, Hamburg, Rio de Janeiro, Singapore, and Tokyo and regional offices in Canada and the United States. Fednav also has terminal, logistics, ice analysis, and shipping agency services and divisions. It employs 280 people and nearly 2000 crew members and stevedores. For more information, please visit http://www.fednav.com. Federal Marine Terminals, Inc. (FMT) is a subsidiary of Fednav Limited and has for over five decades operated stevedoring facilities at ports in the United States and Canada. With ten operations covering twelve ports, FMT operates in the US East Coast and Gulf Coast and in the Great Lakes. For more information, please visit http://www.fmtcargo.com. The Ports of Indiana is a statewide port authority managing three ports on the Ohio River and Lake Michigan. Established in 1961, the Ports of Indiana is a self-funded enterprise dedicated to growing Indiana's economy by developing and maintaining a world-class port system. Information: http://www.portsofindiana.com.